Throughout his entertainment, business, and philanthropic career Gene Autry received many honors, awards, and recognitions from a wide variety of organization. You'll find many listed below and Gene Autry Entertainment will continue to update this section as we research and archive his personal history. From 1937 to 1942, voted #1 Western Star by the Motion Picture Herald Exhibitors Poll (Top poll of the time period). First appearance in the Hollywood Santa Claus Lane Parade. Voted #1 Western Star by the Motion Picture Herald Exhibitors Poll (Top poll of the time period). July 22, 1939 – Gene Autry Day at New York's World's Fair. Installed as first Honorary Mayor of North Hollywood by Martin Pallard, President of Chamber of Commerce. Voted #4 Most Popular Star of the all stars by the Motion Picture Herald Exhibitors Poll. October 27, 1940 – Presented by Metronome Magazine live on Melody Ranch Radio Show with FRED GRETCH trophy. Gene voted the world's greatest Cowboy singer and guitarist. Editorial board of Song Hits Magazine awards him a silver cup for promoting songs of the West, given to him live on the Melody Ranch Radio Show. Gene Autry debuted as Houston Livestock Show & Rodeo's first star entertainer. Sgt. Gene Autry serves in the United States Army Air Corps. June 21, 1944 – Sgt. Gene Autry earned his service pilot wings and promoted to Flight Officer in the United States Army Air Corps. After an absence of several years when he served in the war, Gene Autry returned to the top ten of Western Stars from 1946-1953. Gene Autry in the top ten of Western Stars. Motion Picture Herald in association with Fame present award for being one of the Top Ten Money Making Western Stars of 1947 as voted by the Exhibitors of the U.S. and Canada. April 27, 1949 – Donal J. Connolly, Mayor of City of Trenton, New Jersey, proclaims May 28th Gene Autry Day. Motion Picture Herald in association with Fame present award for being one of the Top Ten Money Making Western Stars of 1949 as voted by the Exhibitors of the U.S. and Canada. Award for "outstanding appeal to the children and in his ability to bring home to the youngsters qualities of kindness, good sportsmanship and clean living." Berkley, CA. "Be Kind to Animals Week"
Receives Honorary Life Membership from Fundy Flying Club, Saint John, New Brunswick, Canada, during Canadian tour. Award for Favorite Western Star on Radio 1954-55 – TV Radio Mirror's Eighth Annual Awards Poll. Planted an honorary palm tree in the oldest Coconut Grove in all of Hawaii, an honor only given to those deemed "an inspiration for fairness, typifying all the qualities of fine citizenship, fine sportsmanship, and clean living." "Showman of the Year Award" – Showman's League of America, Chicago, Illinois. 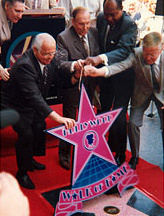 Recording Star at 6384 Hollywood Blvd. Motion Pictures Star at 6644 Hollywood Blvd. Radio Star at 6520 Hollywood Blvd. Television Star at 6667 Hollywood Blvd. "Man of the Year" – City of Hope. Spearheaded a fund drive as well as personally pledging support of the Gene Autry Heart Research Wing. "Humanitarian Award" – Variety Club of Southern California Tent 25. In recognition of his dedication to the welfare of underprivileged and handicapped children. "Citation of Achievement" – Broadcast Music, Inc.
Gold Record from Recording Industry Association of America for Rudolph, The Red-Nosed Reindeer. Elected to the Country Music Hall of Fame in Nashville, and also served on Board of Directors for many years. Elected to National Cowboy Hall of Fame in Oklahoma City. Served as President and Chairman of the Board. "Pioneer Award" – Country Music Association. In recognition of his contributions to music and films since the early thirties. Appointed member of the Advisory Board of California State University, Fullerton. "Gene Autry Award" becomes part of the John Edward Memorial Foundation. Appointed to Advisory Board of Woodbury College, Los Angeles, California. "Better World Award" for humanitarian service – National Ladies Auxiliary of Veterans of Foreign Wars of United States. Appointed Honorary Board Director of American Hall of Aviation History of Northrop Institute of Technology. Appointed Honorary Member of the Chelsea Chamber of Commerce – Chelsea, Oklahoma. "Hands in Applause Award" – New York Sales Executive Club. For contributions to sports and entertainment industry. ASCAP award for Publisher and Composer, outstanding Country Song "Back in the Saddle Again." Masonic Admiralty Award for "Outstanding Service to Masonry and his Fellow Man". Appointed to National Association of Broadcasters Hall of Fame. "Super Titan Award for his support of students and the university" – California State University, Fullerton Alumni Association Board of Directors. Given award by Western Film Heritage Committee. California-Hawaii Elks Major Project Inc. Presentation to Gene Autry "In appreciation for outstanding service to cerebral palsied and other handicapped children." "Grand Knight of Fellowship Award" for outstanding sportsmanship and community affairs – Knights of Columbus. California Angels are the American League Western Division Champions. Inducted into National Broadcasters Hall of Fame in Freehold, New Jersey. Inducted into Hall of Fame Great Westerners – National Cowboy Hall of Fame and Western Heritage Center – Oklahoma City, Oklahoma. Mason's Fifty Year Award for Fifty or More Years of Service – Grand Lodge of Oklahoma, Guthrie, Oklahoma. June 20, 1980 – Los Angeles Mayor proclaims "Gene Autry Week." Masquers honor Gene Autry and California Angels. The California State Museum of Sceince and Industry at Exposition Park presents the Gene Autry: A Time for Heroes exhibit and film retrospective. "Gene Autry Day" "Gene Autry Tribute" – proclaimed by Mayor of Andrews, Texas. "Gene Autry Day" proclaimed in Anaheim. Texas House of Representatives accepts Resolution honoring Mr. Autry for Fifty Years of Entertainment. Inducted into the Newhall Western Hall of Fame. California Air National Guard 146th Tactical Airlift Wing – Appointed Gene Autry an honorary Brigadier General for service to his country for 3-1/2 years in the Air Transport Command. "Man of the West" – City of San Dimas. Awarded for his contribution to Western Culture as a star of motion pictures, television and musical recordings. Clair L. Stout Award for "Distinguished American." Named Honorary Fundraising Chairman of the Orange County Unit of the American Cancer Society. The California Angels players retired uniform No. 26, symbolic of Gene Autry's participation as the club's 26th player. Award from Oklahoma International Film Festival for outstanding achievement and contribution to the motion picture and television industry. "White Cane Award" – in recognition of outstanding service to Lions – Oklahoma Lions. Circus Saints and Sinners honor Gene Autry. American Association of College Baseball Coaches Award for outstanding contributions to baseball. "Distinguished Humanitarian Award" – National Jewish Hospital and Research National Asthma Center. Honorary Doctor of Fine Arts degree from National University. Elected to Thirty-Third Degree – highest honor in Masonry. California Country Music Association's Hall of Fame. "Golden Boot Award" – Society of the Preservation of Western Pictures Motion Picture and Television Fund. Award to America's Captains of Achievement "Representing the many who excel in the Great Fields of Endeavor" – American Academy of Achievement. Anaheim Marriott Suite named for Mr. Autry. "Hubert H. Humphrey Humanitarian of the Year Award" – Touchdown Club – Washington, D.C.
"Distinguished American Award" – USO. "Golden Grape Award" – Palm Springs Women's Press Club. Gene Autry's birthplace – "South Main Street" renamed "Gene Autry Drive" – Tioga, Texas. "Outstanding Senior Citizen of the Year" – Palm Springs Senior Tour and Travel Conference. "Humanitarian of the Year Award" – Coachella Valley. National Sojourners Award in recognition of outstanding service as Actor – Aviator – Mason – Patriot. "Special Award of Merit" in recognition of a long and distinguished career in all phases of the entertainment industry – Publicists Guild of America. "Good Scout Award" – Boy Scouts of America. Southwest Film/Video Archives, Dallas, Texas – Honor Gene Autry for his donation to their film library and his achievements. Americana Ball VI Honoree – Palm Springs Senior Center. "Spirit of Los Angeles Award" – Los Angeles Headquarter City Association. Honorary Director of the Hollywood Chamber of Commerce. Honored by the owner of the Palm Springs Angels prior to a game. Named Pioneer Sportsman of Orange County at a gala dinner benefiting Rotary International's PolioPlus program. Honored as "Pioneer Sportsman of Orange County" by Rotary Club International at Disneyland Hotel on February 4th. "Lifetime Achievement Award" presented at USC Jewel Gala benefiting USC School of Fine Arts. "Headliner Award" – Los Angeles Press Club. Honored at Edison International Field of Anaheim. "Scopus Award" – Desert Friends of the Hebrew University. "President's Merit Award" – National Academy of Recording Arts & Sciences. "California Commendation Medal" for his patriotic support and assistance – California Air Guard. "Suzie Award" – Eddie Cantor Charitable Foundation benefiting breast cancer research for the City of Hope. American Classic Award from American Society of Composers, Authors & Publishers in Nashville, Tennessee. "Grand Cross" – highest fraternal honor, at the 1989 Biennial Session of the Supreme Council of Scottish Rite – Washington, D.C. This award has only been issued 18 times in the history of the Scottish Rite. "Award of Merit" – Rancho de los Palos Verdes Historical Society. "Entrepreneur of the Year Award" – California Travel Industry Association, Governor's Conference on Tourism. Voted into Oklahoma Association of Broadcasters Hall of Fame. Inducted into ProRodeo Hall of Fame & Museum of the American Cowboy – Colorado Springs, Colorado. Special award celebration the King of the Cowboys D.W. Griffith Awards. Inducted into Orange County Walk of Stars. Recognition trophy from Artisa Records for "Here in the Real World" – Alan Jackson. Variety Club Salute to Gene Autry. "President Reagan Award" – Hollywood Westerners Hall of Fame. Tribute to Gene and Jackie Autry benefiting the Leukemia Society of America. The Gene Autry owned publishing company Ridgeway Music Co., Inc. receives a "Citation of Achievement" from Broadcast Music, Inc. for the two millionth broadcast performance of the song "You Belong to Me." "1991 American's Star Gold Achievement Award" – U.S. Marshals Foundation. Tribute for his 25 years of California Angels ownership. Pacifico Avenue renamed Gene Autry Way – Anaheim, California. Inducted into Oklahoma Hall of Fame. "Lifetime Achievement Award" – Songwriters Hall of Fame. Establishment of Gene Autry—Nolan Ryan Scholarship, awarded to high school applicants. "Eisenhower Centennial Award" – Eisenhower Medical Center Foundation benefiting Eisenhower Medical Center and The Birthing Center. Gene Autry Award – Named in honor of Gene Autry, this annual award was established to honor men and women in sports who have demonstrated courage in the face of danger or adversity. Co-sponsored by the Tempe Sports Authority and "Angels Care" in Arizona. Motion Picture and Television Fund Foundation Award – Stars Who Served. Recognition of stars who served so bravely in World War II. Honorary Doctor of Arts and Letters Degree, University of North Texas. In recognition of his distinguished achievements in radio and film as well as in business. Awarded Cowboy Spirit Award by the National Festival of the West in Scottsdale, Arizona. Induction into the California Tourism Hall of Fame. Recognized by "When U Dream a Dream." Board of Directors Lifetime Achievement Award for International Achievement in Arts presented by the Michael Bolton Foundation. Received a Key to Hollywood in recognition of "his lifetime of professional achievement and his incredible contribution to the betterment of our community." Induction into the National Cowboy Song and Poetry Hall of Fame, South Dakota. In front of the Autry Museum of Western Heritage, Gene Autry helps pass 1996 Olympic Torch between Sugar Ray Leonard and his son, Michael Leonard. First of three performers inducted into the Star Trail at the 1996 Houston Livestock Show and Rodeo. He debuted as the Show's first star entertainer in 1942. Country Music Hall of Fame in Nashville, in association with TNN and Fred Tatashore Productions, presents "An Evening of Country Greats" honoring Gene Autry and several other Hall of Famers. Honored with the Los Angeles Area Governors Award Emmy at the 48th Annual L.A. Area Emmy Awards. Received the Spirit of Achievement Award from Junior Achievement of Southern California. Appointment as Vice President of the American League given permanent status. Receives the Will Rogers Cowboy Award from the Academy of Western Artists. The Southern California Sports Broadcasters Association honors him with the Lifetime Achievement Award. Inducted into the National Academy of Recording Arts & Sciences for his recording of Back in the Saddle Again. Inducted into the Jimmie Rogers Blue Yodelers Hall of Fame by the Jimmie Rogers Foundation. The American Cowboy Culture Association in Lubbok, Texas honors him with the Lifetime Achievement Award. First inductee into the Texas Country Music Hall of Fame. Receives the Presidential Citizen's Medal from President Bill Clinton. Honored by the Economic Alliance of the San Fernando Valley at the First Annual Valley of the Stars Gala Dinner. Honored during The Lambs Western Christmas Show, also made an Honorary Life Member. Inducted into the Oklahoma Music Hall of Fame. The Arizona Broadcaster's Association inducts him into its Hall of Fame. Honored on the "Texas Trail of Fame" with an inlaid marker at the Fort Worth Stockyards National Historic District. Named at number 17 on American Benefactor Magazine's list of the "100 Most Generous Americans." Bronze statue, surrounded by replicas of his five Hollywood Walk of Fame stars, dedicated at Edison Field, the home of the Anaheim Angels. For Outstanding Contributions to Texas Aviation History, inducted into the Texas Aviation Hall of Fame. Awarded the Buck Jones Medal of Honor for Achievement as a role model for the youth of America. Gene Autry Reviving Baseball in Inner Cities (RBI) League established whose "youth baseball and softball programs offer Boys and Girls Club members the opportunity to play in organized leagues in addition to learning life skills in a prevention program." Funded by Angels Care. The Golden State – Ventura Freeway Interchange renamed the Gene Autry Memorial Interchange. The Anaheim Angels rename the Owner's Trophy the Gene Autry Award on his birthday, September 29th. Back in the Saddle Again included in Country Music Magazine's list of "25 Songs that Shaped the Century." Included in Oklahoma Today Magazine's "List of the 50 Most Influential Oklahomans." A historic building on the Sony Pictures Studios Lot in Culver City converted to a state-of-the-art digital editing facility and renamed The Gene Autry Building. The Gene Autry Endowed Student Support Fund created to assist students with tuition and fees at the USC School of Cinema—Television. Two songs, Back in the Saddle Again and Rudolph, The Red-Nosed Reindeer, are listed on the Recording Industry Association of America and the National Endowment of the Arts' "Songs of the Century." The Western Music Association presents a tribute to Gene Autry. Texas Monthly April issue – The 100 Best Texas songs by Jeff McCord and John Morthland #12 Gene Autry's version Deep in the Heart of Texas. Toluca Lake Chamber of Commerce in partnership with the Campo de Cahuenga Historical Memorial Association creates the Gene Autry Award to be handed out yearly at their dinner. This award honors an individual or organization that has demonstrated extraordinary devotion to the heritage of the Western United States. Gene Autry is the first honoree. 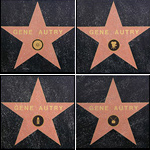 Hollywood and Highland renamed "Gene Autry Square." O'Melveny & Myers completes construction on their new downtown conference center on the 18th floor of their building, and decides to name each one of the conference rooms after a Pioneer of Los Angeles. Gene Autry is the first to be thus honored. John O'Melveny was Gene's first attorney in Los Angeles circa 1934.